The 9th and 10th nerves are tested together. They are responsible for swallowing, phonation, guttural and palatal articulation (the 7th nerve has a component for labial articulation). The glossopharyngeal nerve also subserves taste to the posterior one-third of the tongue but this is rarely tested. check palatial elevation by having the patient sustain an “ah.” When observing palatal movement, look at the palate rather than the uvula. assess the gag reflex by gentling stroking the soft palate on each side. swallowing can be assessed by giving the patient a sip of water and observing them swallow. listen to the patient’s speech. Is there a nasal quality? assess palatal articulation with a “KA” sound, guttural with a “GO” sound and labial with a “PA” sound. the palate should elevate symmetrically, both when sustaining an “AH” and in response to stimulation on either side. Some patients however do not have a gag response and this can be normal if it is absent bilaterally. Patients should also be asked if they feel the stimulus. with unilateral palatal weakness, the palate fails to elevate on the weak side and the gag reflex will be absent on that side. The hypoglossal nerve is motor to the tongue. observe for tongue atrophy or enlargement. do not overcall tongue fasciculations. It is very difficult to relax the tongue. ask the patient to protrude the tongue. ask the patient to push the tongue into each cheek or alternatively to protrude the tongue and push it laterally against a tongue depressor. ask the patient to move the tongue quickly from side to side. if there is facial weakness, correct this by supporting the upper lip on the side of weakness, otherwise there may appear to be deviation of the tongue but once the facial weakness is corrected for, the tongue will no longer appear to deviate. the tongue should be able to protrude relatively straight. Minimal degrees of deviation (i.e. only millimeters) affecting only the tip are insignificant. with tongue weakness, the tongue deviates towards the weak side. the examiner places themself approximately 1 meter in front of the patient. ask the patient to look to each side, up and down following an “H” pattern. pursuit: ask the patient to follow a target such as your finger or a pen with their eyes without moving their head. pause at the ends of each direction of gaze to observe for nystagmus. 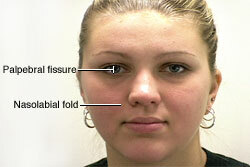 assess saccadic eye movements by having the patient make quick horizontal and vertical eye movements. optokinetic nystagmus is performed by having the patient follow a series of moving horizontal or vertical stripes and observing for nystagmus. test one nostril at a time with the opposite side occluded. patient should not be able to see the stimulus. cloves ideal stimulant since it preserves it’s scent. alternative stimuli at bedside could include soap, toothpaste, perfume, cologne, etc. to perceive the scent with either nostril. unilateral loss is of more concern and could suggest a structural lesion affecting the olfactory bulb or tract or simply due to a blocked nasal passage or deviated septum. bilateral loss occurs more commonly and could be due to rhinitis or damage to the cribriform plate sustained as a result of trauma. test best corrected vision using eyeglasses. any patient with uncorrected visual acuity of less than 20/20 should be examined with a pinhole. Improvement of vision through a pinhole indicates that the error is refractive. test distant vision using a Snellen chart at 10 or 20 feet. or test near vision using a near vision card at 14 inches. the patient is instructed to read progressively smaller lines of letters until they can go no further. most young healthy individuals have vision of 20/20, i.e. at 20 feet, the patient reads a line that a normal eye sees at 20 feet. record for each eye separately, right eye = OD, left eye = OS. 20/30 – 2: The patient missed two letters of the 20/30 line. 20/200: Legally blind. At 20 feet the patient reads a line that a normal eye could see at 200 feet. CF: If a patient is unable to read the top line, have him count fingers at maximal distance. HM: If a patient cannot count fingers, ask them to determine direction of hand motion. LP: If a patient cannot perceive hand motion, see if they can perceive a light. ask the patient to fixate on a distant target. approach the patient from the side. 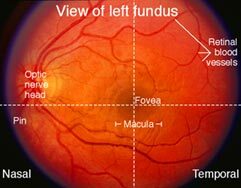 examine the optic nerve and surrounding retina. Light entering the eye travels along the optic nerve to the pretectal region of the mid brain to cause pupillary constriction through the visceral motor and short ciliary nerve components of the ocular motor nerve. observe the pupils for size (measure the diameter of each pupil in mm). observe for any irregularities or asymmetry. dim the lights, ask the patient to look into the distance, shine a bright light obliquely (approaching laterally) into the pupil. Observe for the direct response (same eye) and consensual response (opposite eye). assess for an afferent pupillary defect (the swinging flashlight test) by moving the light from one pupil to the other, back and forth. ptosis is present, if the eyelid covers part or all of the pupil when looking directly ahead. visual fields are assessed by confrontation , i.e. the examiner compares the patient’s visual field to their own and assumes that theirs is normal. first test each eye separately. test both eyes together with wiggling fingers. the examiner places himself approximately 1 meter away from the patient and advises the patient to look directly at the examiner’s eye for monocular testing or nose for binocular testing. The test object (either a wiggling finger, one or two fingers, or a white pin head) is presented equidistant from the patient’s and examiner’s eye and the patient is asked either to state the number of fingers or say “yes” when they first see a moving target. for central vision (the 20 degrees on either side of the vertical meridian) a red pin is used. The patient is instructed to state when they see the pin as red. A red pin is also used to map the blind spot. Vision in the center of the visual field is more detailed than in the peripheral areas. This is because of both the structure of the retina and the connections of its neurons. Light rays from the center of the visual field are focused on the macula in the center of the retina. In the macula, the proportion of cones to rods is high. Cones are important for color vision. the normal peripheral monocular visual field extends approximately 90 degrees temporally, 60 degrees nasally, 60 degrees superiorly and 75 degrees inferiorly. It is divided into nasal and temporal halves and superior and inferior altitudinal halves. The normal central visual field extends approximately 30 degrees on all sides of central fixation. The blind spot is located 15 degrees temporal to fixation just below the horizontal meridian. It corresponds to the optic disc.